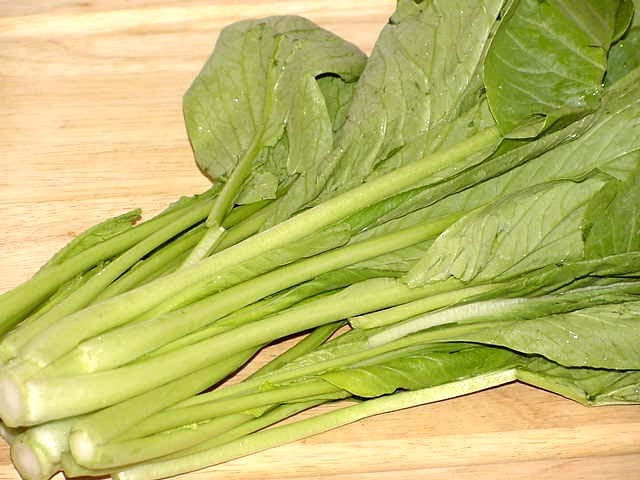 This is some beautiful yu choy I bought last week at the Asian grocer that opened down the street. It's owned by the same people who own the restaurant the other direction down the street from me, which closed without warning the other day. I fear the grocer isn't long for the neighborhood, either. Which is too bad, because they have all kinds of interesting things I was just beginning to have the chance to explore. I'm really bummed that I only wrote one post last week. I'm determined to do better from now on. Monday -- Gemelli with Gailan, cherries, and some red grapes. 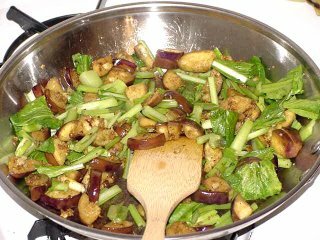 Tuesday -- 2 hard boiled eggs and some curried Japanese eggplant and yu choy. I used the Madras tamarind curry powder I got for my birthday and it was delicious. The spices tasted really fresh and it was pretty hot. I cooled it down with--surprise!--red grapes and cherries. Wednesday -- Pretty much a repeat of Tuesday. Thursday -- 2 hard boiled eggs, black bean and walnut salad with corn tortillas, red grapes, and cherries. Friday -- Black bean and walnut salad with corn tortillas, red grapes and cherries. I have some pictures of the eggplant and yu choy curry in production, but I forgot to take a finished picture. I made it totally on the fly so I could have something to take for lunch, so I never plated it. It wasn't until I took the last of it to work on Wednesday that I remembered I hadn't ever taken a picture of it. So if you just have to see how things end, you might want to look away now. First, I was just going to have a vegetable saute, so I threw some garlic into some oil and let it saute for a minute or so. 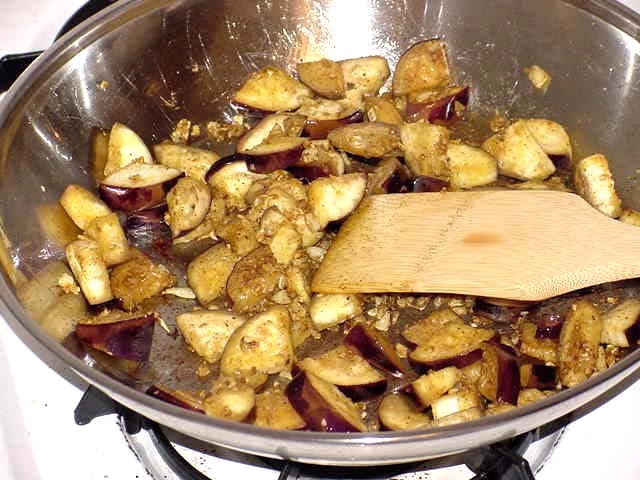 Then I added a sliced japanese eggplant and let it saute for about three minutes. Next came the stems of the yu choy, which I cooked for another two minutes or so. It was about this time that I realized I could make a curry out of it with the Madras tamarind curry powder I've been eager to try ever since I got it for my birthday in May. So I added that next. And then I thought it would be really good with some chicken stock. Didn't I have some in the freezer? Yes, but it was frozen solid (you know, being in the freezer and all). Ok, throw it in the microwave to defrost and hope it will become liquid enough before the eggplant burns. And of course, this all occured after I had already added the curry powder, so I had to worry about that burning, too. But I lowered the heat as much as I could and counted the seconds until the chicken stock was defrosted enough for me to throw it into the pan, and luckily nothing burned or overcooked too much. I covered the eggplant and yu choy stems and let the mixture simmer for around 10 minutes. 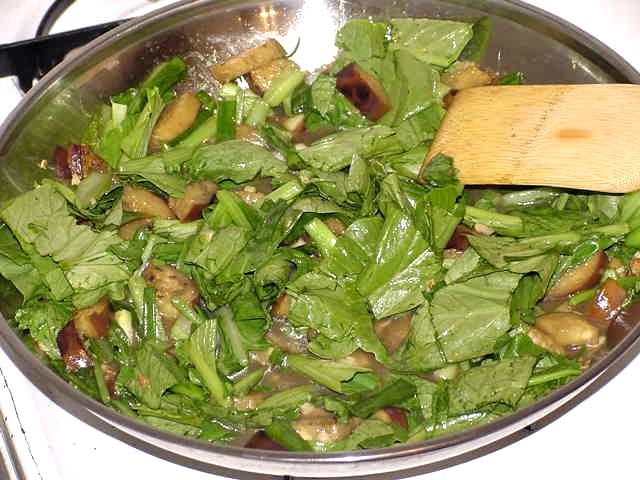 Then I threw in the yu choy leaves and let it simmer for another five minutes. For such an impromptu mess, it turned out pretty good. I wish I could show you the finished product. The curry was rich and dark and had a lot of heat. It made a nice lunch. Next time I'll plan ahead enough to make some rice to go with it. I'm eager to use the Madras tamarind curry again. Last night I met a friend for dinner at Koryo, a Korean restaurant that opened up a little while ago. I splurged and had an OB lager, a Korean beer. It was $7.00, which I thought was pretty steep, but I figured it was imported and ordered it anyway. When it came, I saw that it was about half again as big as my friend's beer, so it really wasn't that much more expensive after all. It was very good--light and crisp. We had kim-chee and beef dumplings for an appetizer and they were amazing. With the first bite you get the sharp sourness of the kim chee, followed by the richness of the beef complemented by the slight sweetness of the dipping sauce. I could have made a meal out of those. My friend ordered Chap-Chae, clear vermicelli noodles stir-fried with beef and vegetables that she said was very good. I ordered Yuk Gae Jang, which sounded similar to my friend's except for the red pepper, because I was in the mood for something spicy. Unfortunately, the menu didn't mention that it was served in a bowl with a soupy broth, rather than as a stir-fry. It tasted good, but I was more in the mood for stir-fry. They served several small bowls of side dishes. There was a white pickled radish that was tasty and refreshing, some cucumber, potatoes (pickled, I think), fish cake, zucchini, and kim chee. Can you tell the radish was my favorite? They also had sushi on the menu, which surprised me considering it's a Korean restaurant. The waiter exlained that, while the sushi is Japanese, they serve it with sauces that are Korean. Sounds interesting. It was a little fancier and a little more expensive than I was expecting. From the outside it doesn't look like much, just a neighborhood restaurant. But when you walk inside you see that the floors are beautiful black stone, the tables and chairs are metal and chrome, it's fairly austere and aesthetically pleasing. It was a lovely way to relax and unwind after a busy weekend for both of us. I will definitely go again. I'm keen to try that sushi.